Halloween Comic Fest and Capitol Hill-O-Ween 2018! Attention all you ghouls, goblins, aspiring super-heroes and fanciful woodland creatures! The nights are long, the air's extra chilly and it's time once again for Halloween Comic Fest 2018! 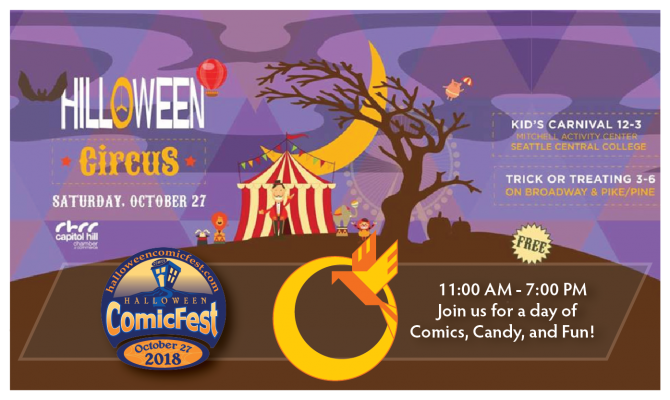 What is Halloween Comic Fest? Halloween Comic Fest is really pretty simple. And from 11:00AM til 7:00 PM Saturday October 27th, we're giving away a bunch of Halloween themed comics for free! Think of it as bonus swag to go with the sugar-coma-inducing levels of candy that you'll consume that evening. Or maybe just a really good spooky story to read to the kids as they wander past that old mansion that no one dares knock on the door of (which everyone knows always have the best candy!). At any rate, we'll got a selection of books for any and all age ranges, laid out on tables ripe for the plucking! We've also got free bags for those who didn't bring buckets or the old halloween staple - the pillowcase. For more information on what comics we'll have this year, check out the site for Halloween Comic Fest here! Other ways to spend Halloween on the Hill! If you're looking for ways to maximize your swag or enjoyment of the season this Halloween, you should also check out Hill-o-Ween at the Seattle Community College's Mitchell Activity Center this year. They'll be hosting a kids carnival from noon to 3 PM, and starting a trick-or-treat parade down Broadway from 3-6 PM! Parents this is the perfect thing to be doing before or after you stop in to pick up some of our free swag! You can check out the website for their event here, or visit their Facebook page for more information about what other activities will be going on this Saturday!